Hey-ho! 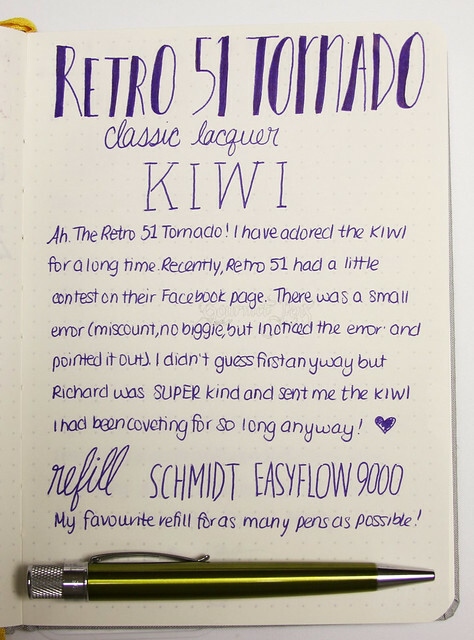 This pretty kiwi pen came over from Richard at Retro 1951 after a contest on their Facebook page (a great reason to follow them on social media, by the way). There was an error in the contest that I pointed out, and although I wasn't the actual winner, Richard was ever so kind as to send me a Tornado anyway as thanks. That is some pretty awesome customer service. You know what I LOVE? Awesome customer service. So although I was already a fan for life, I'm an even more of a loyal fan now. Thank you, Richard! 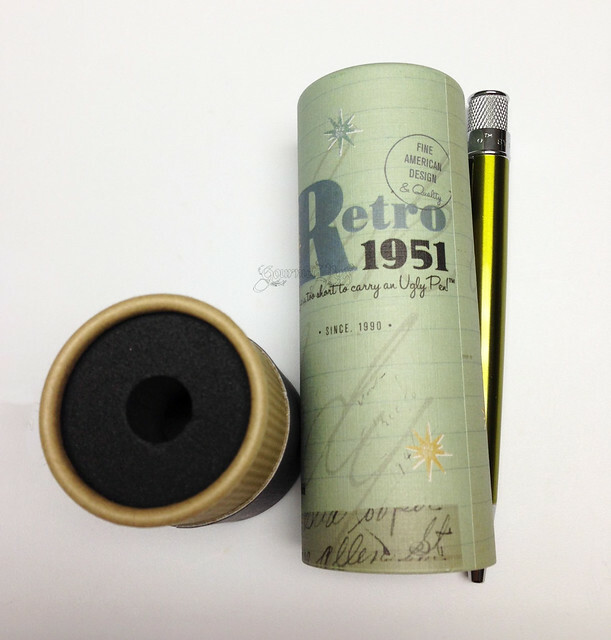 One of the best things about Retro 51 pens is the fun packaging. The Kiwi Tornado came in this cardboard tube with foam inside. 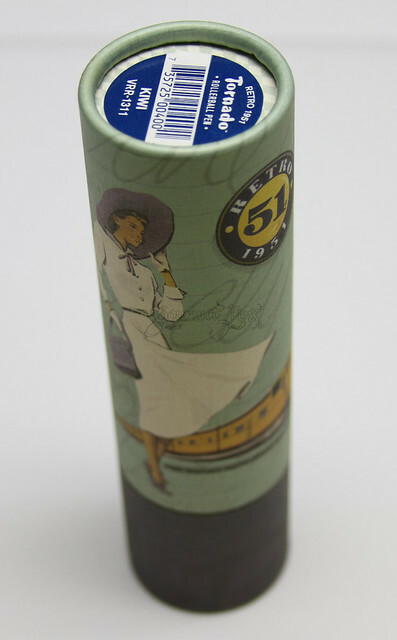 The packaging is very fun; should you wish to recycle the tube, you can. You can also reuse the foam for shipping stuff to a friend. Or you can use the whole thing as a pen stand for your desk. The Kiwi Tornado is a nifty pen, and Tornado is a suitable name as that is what the pen's shape is. The top of the pen is wider and it narrows towards the tip. The barrel is lacquered in a smooth glossy kiwi colour. The clip and knurled knob (more on this in a jiffy) are shiny chrome. Ok. 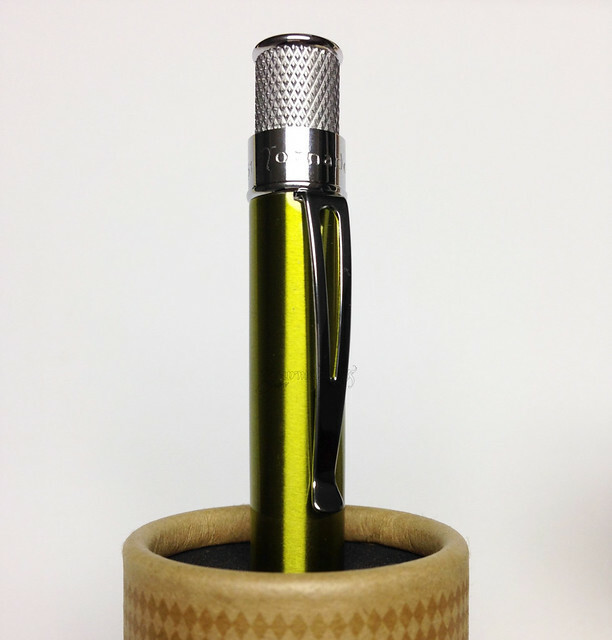 The knurled knob: a highlight of Retro 51 pens: the knurling on the knobs. The mechanism for extending the tip is a knob that you twist and the knurling is gorgeous, sharp, clean. I love it. The pen ships with a Retro 51 refill, but I always use my go-to ballpoint refill - a Schmidt EasyFlow 9000. With this refill, I am completely content. It's very smooth, and it flows consistently and doesn't blob. If you get a dud, don't be disheartened. It happens. Schmidt will probably swap it for you. Anyway, nevermind that. The point is this Tornado is great. It's not too heavy, it's comfy, it writes very well, and it has a clip that secures snugly to papers and pockets. Easy to get refills (and various refills). I have reviewed my Natural Bamboo Tornado and the Crocodile Tornado, neither of which have disappointed me. Yes, the Croc is weird, but that's what I love about Retro51s. They are weird, and unique, and fun. I love these pens because they are fun and cute and come in great colours. I highly recommend Retro51 pens! I just ordered a Lincoln yesterday! So excited. I opted to get some fine Capless refills for the pen since I prefer a finer point. I would like to try an Easyflow in one of my Parker Jotters. Will have to order some. Awesome - the Lincoln looks great. That's on my JetPens wishlist :) I really like the EasyFlow refill but it is indeed broader. Certainly a medium point at least. I'm working my way through a bunch of my Retro 51 collection on my Instagram this week (and likely next). I love the Tornados and have about 20. While I like the larger "Big Shot" model, these Tornados are just great, solidly built fun! While I like the Schmidt Easyflow refills, I've been wanting more color in my writing. more ink colors but I'm just glad there is a free flowing ballpoint out there that is not dry and scratchy.